Colombo Telegraph carried transcript of speech by TNA leader R Sambanthan on 5 April 2019 titled Mullaitivu 2009: 400,000 Lived, 290,000 People Came Out, What Happened To The Balance? – Sampanthan Asks”. 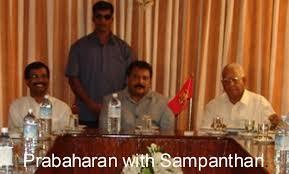 Sambanthan claims that on 21 January 2009 he highlighted plight of some 400,000 but as per press release on 21 January 2009 published by Tamilnet, TNA claims there are over 360,000 IDPs out of a total population of nearly 500,000 people in LTTE controlled areas. This entire population is living within an area of about 400 square kilometers”. Sambanthan cannot give press releases and then say something else in Parliament on the same day! Sambanthan claims he protested on 21 January 2009 regarding Tamils being fired at and ‘running helter-skelter’ however as per Tamilnet website TNA press release addressed to the international community claimed ‘over 360,000 IDPs out of a total population of nearly 500,000 people’ were in a 400 sq.km area. Based on what evidence is the TNA placing a population figure of 500,000? How many LTTE were there to herd this many people with them? There would be no civilians with LTTE, if the LTTE did not herd them. Can Sambanthan answer this simple hypothetical question. TNA press release quotes 66 civilians killed – how many of these died while trying to flee LTTE? Sampanthan claims 40,000 people have been killed – who claimed this & on what evidence? Even the Ban Ki Moon Panel report says 40,000 may have been killed” which is not the same as 40,000 was killed. While those that claimed less than 10,000 dead can produce names & details of every person dead, those that claim 40,000 & more are only throwing numbers. Its now 10 years since LTTE defeat. No one claiming 40,000 dead has produced names of 40,000, details of their families and no one has even filed police ‘missing’ or sought death certificates. There are no skeletons either and its no easy fete to be digging graves to stuff 40,000 dead bodies (not even in skeleton stage) while engaged in hostilities with LTTE who were in uniform, in civilian clothing and civilian LTTE force as well as civilians forced to take up gun dying for which LTTE must take full blame for putting non-LTTE combatants in harms’ way. Sambanthan claims probably around 400,000 based on our own investigations’ were with LTTE. What investigation was this? How many of them were LTTE cadres, how many were civilian LTTE & how many were really civilians? Sambanthan claims food, medicines and other supplies were sent only for 60,000 – 70,000. The Government & the UN agencies sent supplies. It was obvious that bloating up of numbers were given as LTTE needed provisions for their cadres & families lest the conflict dragged on. There is enough evidence to highlight that Tamils that were not associated with LTTE were denied food & essentials sent by the Govt. Connecting the dots of allegiance – it was no coincidence that TNA supported the regime change that took place in 2015, it was for that reason that TNA with just 16 MPs in a 225 Parliament became the Opposition & TNA leader the Opposition Leader. For the first time the TNA supported the budget. TNA supported the government at every crucial juncture inspite of being in opposition. TNA leader was not vocal for the Opposition except to promote the demands of Tamils aligned to TNA. UN & UNHRC conducted 2 investigations and they have found absolutely no evidence to substantiate their claims except continue to quote 3rd party / 4th party ‘invisible witnesses’. On 12 February 2009 the military declared a new 10 square kilometres (3.9 sq mi) Safe Zone in this area, north-west of Mullaitivu town. All of these UN heads & international agencies quote from sources outside of the war terrain and thus they cannot be accepted as witness accounts. As for those claiming to be ‘eye witnesses’ they must first establish they were actually in the war terrain. Sambanthan is quoting various international parties questioning Sri Lanka’s dead but why has Sambanthan not asked – the lost generations of Tamils because of LTTE that created TNA? How many young men, women were denied their right to educate, work and make a career for themselves & ended up holding a gun & wearing a cyanide capsule? How many LTTE cadres & child soldiers died following orders to commit suicide by biting cyanide capsule – LTTE must take full accountability for these suicides. How many LTTE cadres were trained to commit suicide – taking one’s life is a crime, training people to commit suicide must be far worse a crime. Sambanthan is quoting the US Constitution – the Colonial British invaded the Americas and colonized it initially with prisoners from British prisons in 1607. It took just 169 years for the 13 colonies to severe ties with Britain and declare independence adopting confederal constitution in 1776. When 7 out of the 34 confederates attempted to secede the confederacy was abolished and replaced with the present constitution in 1790. Confederacy which ITAK/TNA promotes did not last even 20 years in US. Sambanthan quotes Indira Gandhi on Bangladesh & asks the question ‘how long has the Tamil question remained unresolved”? We would like to know what is the Tamil question first and we have been asking this for 70 years! All that we have been given is a bucket-list of solutions without knowing what the problem is. We would like to challenge Sambanthan’s statement that Tamils are ‘second-class’ citizens – Tamils & Muslims constitute the larger populations in Colombo 1 to 15 capital of Sri Lanka. Tamils & Muslims run the main wholesale business in Sri Lanka. Tamils have the most jewellery outlets, communication outlets pharmacies in Colombo. Both the present & past governors of the Central Bank were Tamil. There are over 30 Tamils in the 225 member Parliament representing all political parties. Tamil political party held the post of Opposition in 1978 and 2015. What is it that the Sinhalese enjoy because they are Sinhalese that the minorities do not enjoy because they are not Sinhalese”? What is it that the minorities do not enjoy because they are the minority that which the majority enjoys because they are the majority”? What is legally, constitutionally & legislatively given to the majority that is not given to the minorities”? Name a single country that has changed its original national anthem, national flag just to please & appease the minorities & have these afforded any reciprocity by the minorities? Tamil was made official language by India’s Indo-Lanka Accord in 1987 and there are less than 2million Tamils physically residing in Sri Lanka. India with over 70million Tamils and a separate Tamil only state has not even made Tamil an official language or including anything Tamil in India’s national flag. Name a single country where Tamils are the minority which have declared Pongal as a national holiday, Maha sivarathri, Deepavali as public holidays. Name countries where Tamil minorities are given cabinet rank positions in government representing minority political parties, top post in Police, foreign minister, chief Justice (Sri Lanka has had 3 Tamil chief justices), judges & ambassadors. Name any country that will allow laws like Thesavalamai to exist when everyone chants equal law – equal justice for all. Tamil minority are powerful in many ways – Largest supermarket chain is Cargills and recently the Govt gave state funding to it. The largest brewery is Carsons owned by Tamil family. Largest media network is owned by the Maharajah family who also own the largest hardware – SLON, Kevilton. The largest construction conglomerate St Anthony’s is owned by the Gnanam family. If Tamils have left the country, it is by their own free will & as a result of them leaving and being domiciled in Western countries they are helping their families back home. We would like by affidavit for TNA MPs to confirm that they themselves are not dual citizens as many of their children are studying overseas. Sambanthan refers to the North-East development – we like to remind him that LTTE ran a defacto rule for almost 30 years in full control of these areas while LTTE was making annual profits of $300m so the better question is what did LTTE do with this money if it really stood for the needs of the Tamil people. Immediately after LTTE defeat those that visited the North-East could see for themselves that other than posh bunkers for LTTE and fancy homes for LTTE families all others were living in horrible conditions. Some areas of the North-East did not have electricity, were not allowed to watch tv even. These people were living in the cave-days under LTTE rule. The Sambanthan-Sumanthiran letter to Finance Minister Mangala regarding a special fund takes us back to the PTOMs where a similar proposal was made for even direct funding to come to LTTE held areas without going through the Central Govt. The very areas Sambanthan covers are identical to the proposals suggested by the PTOMs and ISGA. Why should there be a special fund starting with Rs.5billion only for the North which is the least populated of all the provinces in Sri Lanka? Allocation is given to each of the provinces based on the funding requested by the provinces and the Northern budget is almost always 2nd to that of the Western province but it is never spent & returns to the Treasury while there is a separate budget allocation for each province spent by the Central Govt to develop the provinces & this gets spent and is accounted for. What audacity for Sambanthan to ask Rs.5b only for the north when 7 out of 10 people are Sinhalese tax payers and Sambanthan & TNA are eternally accusing Sinhalese of treating Tamils as second-class citizens. What right does the Finance Minister have to create such a fund only for the North & camouflage that by calling it ‘Palmyrah Fund’ and open it for ‘donations’ obviously serving as an outlet for money-laundering and we like to question why the PM is also the Minister for Northern Development too – does the PM function only for the Northern Province? Sambanthan or TNA cannot be allowed to get away spreading lies & distortions when successive governments should have investigate TNA for links with LTTE and applied 6th amendment against TNA for there is ample evidence by TNA statements and photos to depict the TNA’s gameplan. Where are the next of kin of the supposedly executed 40,000–125,000 Tamil civilians in Sri Lanka? How many Tamils killed ? Whether LTTE cadres or not it is not important how many Tamils are killed. What si important is how many Tamils are alive and how many Sinhalese are alive and how many others are alive. It is also important that those alive are not exploited for the purpose of politicians to get rich, rule over them than serve them and cheat their votes giving various promises. Sinhalese must stop sacrificing their valuable lives, money, property, education and job opportunities for Tamils or for Sri Lanka. It is not worth it. Such an ungrateful community. Ultimately what matters is the interest of Sinhalese. Not Sri Lanka. As things are shaping up, Sri Lanka becomes unfeasible by the day. Sinhalese must protect their own selfish interests before it is too late.